I thought they turned out beautifully! thought these were unbelievable, and I loved that I could use half the dough for pretzels, and the other half for pizza (dinner). 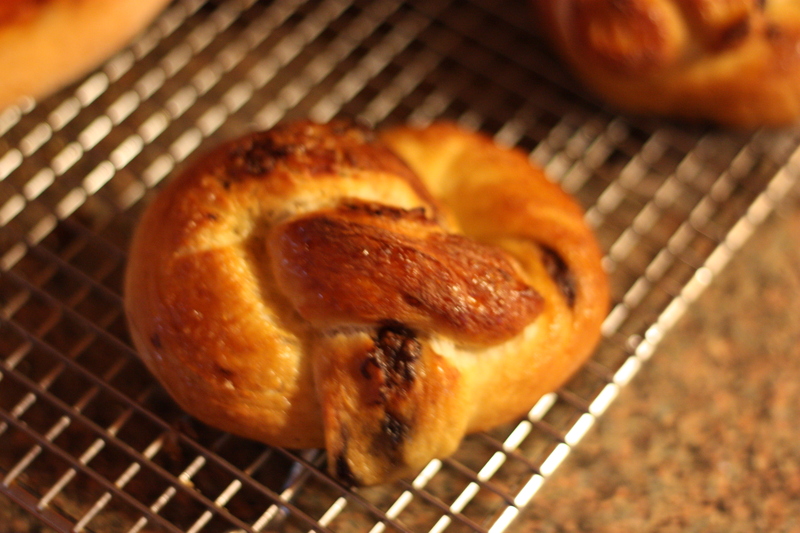 I made the chocolate variation, and right out of the oven, I thought these pretzels tasted a lot like pain au chocolat–with no butter, I might add. Definitely a fun treat! Place dough on a lightly floured work surface; sprinkle with nuts, chocolate, or fennel seed. Gently knead to incorporate. Transfer to an oiled bowl, cover with plastic wrap, and let rest 1 hour. Divide dough into 8 equal pieces. On a lightly floured work surface, roll each piece into an 18-inch-long rope. To shape dough into pretzels, form each dough rope into a U-shape and twist ends twice. Fold twisted end down and pinch to secure (see below). Transfer pretzels to an oiled baking sheet and let rest 20 minutes. Whisk sugar, oil, and salt into yeast mixture. Add flour and stir until a sticky dough forms. Transfer dough to an oiled bowl and brush top with oil. Cover bowl with plastic wrap and set aside in a warm, draft-free place until dough has doubled in bulk, about 1 hour. Turn out onto a lightly floured work surface and gently knead 1 or 2 times before using.